The Tune du Jour is "Let's Twist Again" By Chubby Checker! Bottom photo: The "apple of Sam's eye", his granddaughter Kate (in the front) performing at the Greek Food Festival earlier this fall. This is the last of my Portraits From My Heart series. I guess it's fitting that the last portrait is of my first grandchild Lindley. I had the privilege of photographing her very first cry and capturing her daddy's tears as he gazed at his precious daughter for the first time. She has delighted us with her first giggle, first steps, first words, first loose tooth and hearing her read her first words. Now she's a big second grader and smarter than her Mumsie! On second thought, maybe it's not the end of the series. I might have more to share from time to time. I have a new blog! 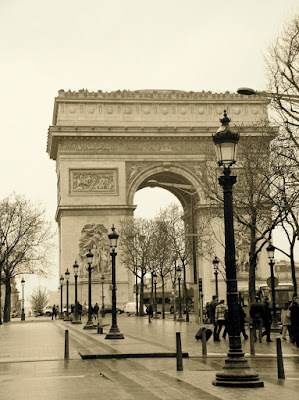 "Paris Through My Lens" - a photo diary of my recent trip to Paris. Discover Rod Stewart featuring Chris Botti! Well it's time to get back to Birmingham and join up with the Skywatch Friday gang! I took this photo about a month or so ago. This is the Birmingham skyline with the Charley Boswell Public Golf Course in the foreground. This is right in my neighborhood and I love seeing the rolling hills and nicely landscaped course when I pass it a dozen times a day. I also like that they chose to honor Birmingham's own Charley Boswell, a pro golfer who just happened to be blind and one wonderful man! To see how all the other SKYWATCH FRIDAY participants captured their little piece of the sky click here. I plan to post 4 photos a day (maybe) so please stop by from time to time. Today is very special for Americans. A day we stop to give thanks. I am thankful for this wonderful country I am privileged to live in, for my dear family and friends, my good health and this year I must add a few more. This year I am so very thankful for the gift of time my retirement has afforded me. Now I am able to share my time and talents in so many ways. I am also grateful for the friendships this blog has brought my way. What a generous, thoughtful, caring group of friends you have become. I am touched on a daily basis. Today's top photo is what we call "Indian Corn" here. Who ever heard of Thanksgiving without some Indian corn hanging somewhere!! Bottom photo: Thanksgiving is a shop in the Marais district of Paris. They have everything you could want to make your very own American Thanksgiving feast in Paris! The store had not opened when we strolled by, but I pressed my nose against the window and got a look inside. They have it all and even had boxes of fat orange yams! What I'm nibbling this morning with my coffee: A leftover caramel macaron that i bought last Sunday! Well it's pretty yummy and reminds me of Paris. Anyone know if you can buy them in the US? Tune du Jour is "What A Wonderful World" by Louis Armstrong! For a photographer, Paris is a blessing and curse. For me, it is a constant feast for the eyes. But on the other hand, Paris has been photographed from every possible angle for so many years by the world's finest photographers. Intimidating indeed to find something new and interesting. I don't pretend to do that. 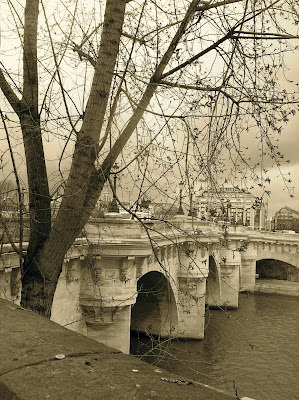 I seek only to capture Paris for myself, so that when I look back on my photographs, they are not just replicas from a guide book, but evoke a memory of a special moment, place or person. 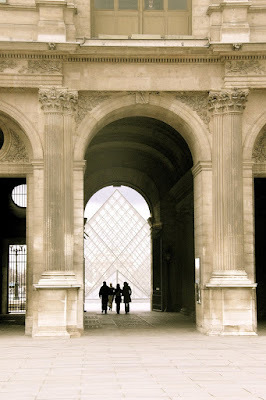 Today, a visit to le Musee du Louvre. One thing I really missed while I was away was Michael's music. It's good to hear it again! Reentry into "Reality World" is hard. In the Dallas and Birmingham Airports noone spoke a word of French to us and I couldn't find a good piece of brie anywhere!!! I arrived home tonight at 10:30 after being up for almost 22 hours. You knew I couldn't go to bed before I had downloaded all my photos, right??? Then the question, "Which ones to show you today?" I am a zombie so I just picked two to start us off. Thank you all for you wonderful comments while I was away! I checked them as often as I could and it meant a lot to have you along for the ride. 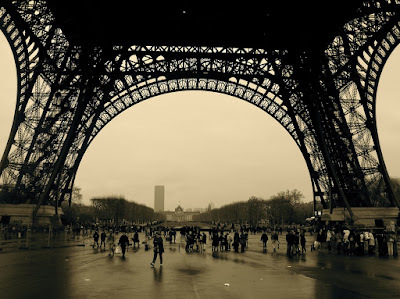 I have decided to do an additional Paris Travel Blog with selected photos very soon. I will not write much and instead include more photos each day. I am certainly not in competition with Peter and Eric, but think my travel blog should be separate from my Birmingham Daily Photo. That's really just exactly what I need to be doing.... more blogging! Ha I will be around to visit you all shortly. I have missed you!!! P.S. Thanks D.C. for blogsitting. I will be happy to give references to any future clients you might have! Today we bid Paris farewell. ( Pass the Kleenex please !) I leave you with one last image. 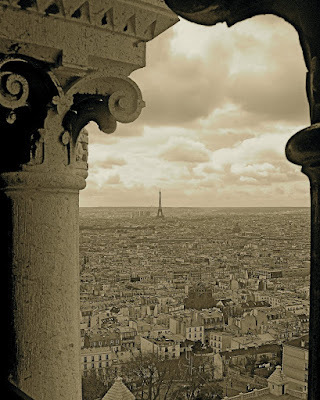 Probably my favorite photograph, it was taken from the dome of the Sacre Coeur in March, 2007. A breathtakingly beautiful sight, in more ways than one. No, there will be no sequel to this one! These antique seltzer bottles are from Architectural Heritage. Another one of those things that I have had a go at photographing many, many, many times. Plastic, screw-top seltzer bottles just don't do it for me like these do! Bottom Photo: Arc de Triomphe in the rain. Update! Today is our last day in Paris. We are heading off to the Louvre and then to the Musee Rodin! A little snow is predicted and that would be a photographer's godsend if I ever saw one!!! It has been a wonderful week! Paris photos will be forthcoming and I will have to figure out the new blog thing. The long flight home will give me time to plan. D.C. , tell my blog to get the house all cleaned up for my arrival. Will there be champagne? I am quite used to that now you know. I am in Paris this week. My photos have been preposted. In addition to the Birmingham photo each day, I am including a Paris photo from my last visit in March, 2007. Thanks for stopping by. In 1913, the Jefferson County Savings and Loan, now the City Federal Building, opened its doors. Located downtown on 2nd Avenue North, this 27 story terra cotta faced building is still the tallest neo classical skyscraper in the southeast. Thankfully spared the wrecking ball, it is now open for business as City Federal condominiums. Bottom Photo: Eva and "L'ami de personne" (Nobody's Friend). 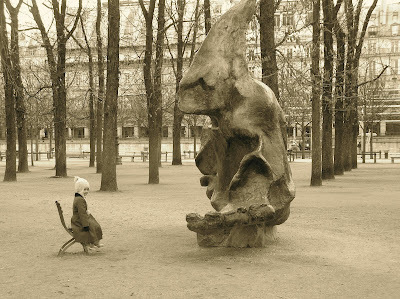 This bronze by Swedish sculptor Eric Dietman, is in Jardin des Tuileries. I am in Paris this week. My photos are preposted this week. In addition to the Birmingham photo I am including a Paris photo from my last trip in March, 2007. From time to time I may leave a comment from Paris. Thanks for stopping by. Bonne weekend! Birmingham played a large part in the Civil Rights Movement. Thankfully, our city has come a long way since the turbulent 60's. This is Kelly Ingram Park. I featured it previously here. This photograph captures the statue of Dr. Martin Luther King, Jr. looking towards the 16th Street Baptist Church. To the left is the Civil Rights Institute. We remember with pain, the past and look forward to continued healing and progress for our city and our country. I am in Paris this week. I have preposted my blog. In addition to the Birmingham photo, I am including a Paris photo from my last trip in March, 2007. I may from time to time leave a comment from Paris. Thanks for stopping by. Bonne weekend everyone! For those of you who have grown up in Birmingham, this building is instantly recognizable. This wonderful Art Deco detailing is from Loveman's Department Store in downtown Birmingham. This grand old lady evokes many fond memories.... eating lunch on the Mezzanine, the glove department, the elevators with attendants in white gloves, the fabulous Christmas windows...and so many more. This building now houses the McWane Science Center. I am in Paris this week. I am preposting while I am gone. In addition to the Birmingham photo each day, I am adding a Paris photo from my last trip in March, 2007. From time to time I may leave a comment from Paris. Thank you for stopping by. Why be in such a hurry to get to work? Relax and relive days gone by. Let Birmingham's rapid transit system get you where you need to go at a leisurely pace! I am in Paris this week. While I am gone, I will be preposting my blog. In addition to the Birmingham photo, I will be including a photo from my last trip to Paris in March , 2007. From time to time, I may leave a comment from Paris. Thanks for stopping by. Top Photo:A few weeks ago, I had the pleasure of meeting my friend Jim and two of his grandsons taking a leisurely stroll on the walking trail. What is it about little boys and big sticks? 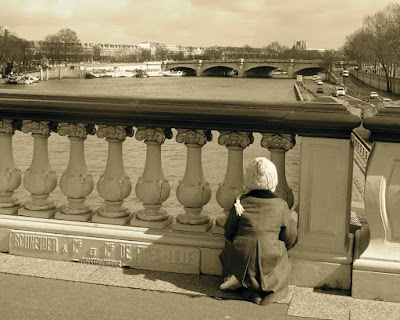 Bottom photo: My Eva having a look down the Seine from the Pont Alexander III. I am in Paris this week. I am preposting my blog while I am gone. In addition to the Birmingham photo each day, I am adding a Paris photo from my trip in March, 2007. I may from time to time post a comment from Paris. Thank you for stopping by. 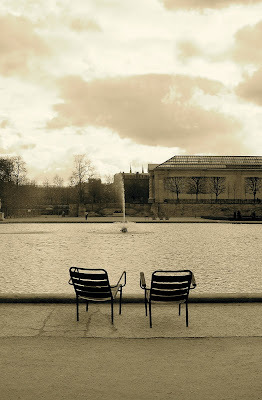 Today, with any luck at all, Karen, Peter and I will be in Jardins des Tuilieries, sitting in the chairs below, sipping a little of the above. La vie est tres bonne! Top photo: Highlands Bar and Grill on Birmingham's southside. This is the flagship restaurant of Chef Frank Stitt. When you come to Birmingham, you must eat here. Mary, next time we will! My friend D.C. 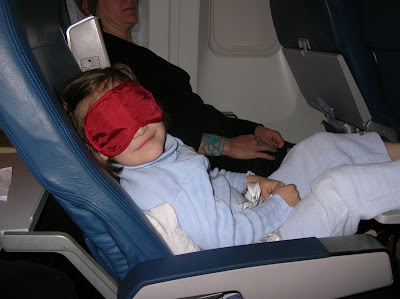 Confidential has graciously consented to blogsit for me while I'm gone. Should Blogger send the gremlins out, she will fix it right up. You just never know. Thanks, J.! I am in Paris this week. I am preposting my blog entries. Each day I am including a photo from my trip to Paris in March 2007 , in addition to my Birmingham photo. I may from time to time leave a comment from Paris. Thanks for stopping by! The Tune du Jour is on the sidebar this week. Enjoy! 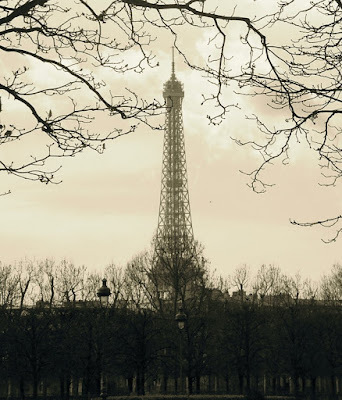 The Tune du Jour is.... "Paris tour eiffel" by Le Grand Orchestre du Splendid. I think our friend Olivier in Evry, France, introduced me to this song. Merci, Olivier! This adorable video will give you a taste of France today! I hope you enjoy it as much as we all have! Eva had it all figured out on our trip in March , 2007. Luckily her tiny legs fit on the tray table. No leg-room was not a worry for her. For her Mumsie....yes! Discover Le Grand Orchestre du Splendid! Photo Below: Another quartet in monotone. A little something for everyone today! PARIS COUNTDOWN..... Taa Dah..... ONE DAY, JUST ONE MORE DAY! An Upper Lobby window of Regions Bank , downtown Birmingham. Not my usual fare, but I try to step out of my prissy French box every so often. I like the starkness and strong black geometric image. I didn't have to desaturate this one, a natural monotone. A tip of the hat to Mondrian, oui? BIG BLOG NEWS... Our friend Bob Crowe over at St. Louis Daily Photo has added a new blog, Gateway. Now you don't have to wait till Thursday to see his excellent interpretations of St. Louis' famous Arch! Bravo Bob!!! PARIS COUNTDOWN.... TWO, just TWO DAYS!! Oh my - I am turning into the parking deck downtown and I see this gentleman, so dapperly dressed. I grabbed my camera and hoped for some decent shots throught the car window! He was just too good to pass up. Where was I headed? I was on my way to Regions Bank downtown to get my euros! Now I am starting to believe that my trip is just around the corner! PARIS COUNTDOWN.... 3 DAYS! Oh My Goodness! A trip back to Oak Hill Cemetery. This time I am showing my friend Mary (from Cincinnati, OH) around town. We met on Virtual Tourist last winter. What brought us together? Our mutual love of Paris. We met in person Monday night when she flew in to spend a day or so with me in anticipation of my upcoming trip to Paris. We did a whirlwind tour of Birmingham today. We took a long walk on my favorite walking trail, had barbeque at the Golden Rule in Irondale, shopped at the Pepper Place and made a special stop at Oak Hill Cemetery. She just had to see it. I took this photo of these beautiful doors while we were there. We finished the day off with not one but three stops for drinks, dinner and dessert at some of my favorite places. What a grand time we have had together! We been here to the Garage before. These gates probably don't look familiar to you because I first posted them here way back in June when almost noone in "blogland", but Rambling Round, Dusty Lens and Tom Wigley knew I was alive! I also posted what's on the inside of these gates here. The Garage is a well known place in Birmingham for assorted "stuff" and a funky little bar as well. I love these gates so I am happy to have a chance to show them off again. I would estimate I have taken close to 60 shots of them from every angle and every time of day. That rich rust color and the graphic element is very appealing to me. I envisioned a grouping of 4-6 different shots of them hanging in my home ....... still on the To Do list. I have come to the realization that the gates might be one of those things that I really like and perhaps few others feel the same, and that's OK with me. Call me quirky! I am resisting the urge to go into HOUR mode. Will save that for the weekend! Hang Out With the Swingers! grassy area where kids (and grownups) can play ball, throw a frisbee to Fido or just run, run, run! Lovingly kept up by the Friends of Triangle Park, it is a favorite spot for play dates and birthday parties. The last Sunday before Christmas you will find it packed with excited kids. That's when Santa comes on the fire truck from the Clairmont Fire Station down the street and everyone sings "Rudolph" and Santa passes out candy and causes a few tots to have a hissy fit! I will definitely have some photos for you then as well. Today's photograph was one I took after the only real rain we have had in weeks. Who are those two cuties at the bottom??? Hmmmmm. The third shot is one of two picnic tables decorated with tiles handpainted by the "Friends". As many of you already know, our Birmingham Museum of Art has had the privilege of hosting a very special exhibition of 11 important drawings and the Codex on the Flight of Birds by Leonardo da Vinci. The very first time this collection has ever left the Biblioteca Reale in Turin made this exhibit a must see. Today we say, "Arriverderci Leonardo". He will leave us and go to San Francisco , then home to Turin, Italy. As is typical for an exhibit of this importance, we have seen a wonderful turnout the entire time, but the last weekend we had visitors willing to stand in line for almost 2 hours to spend a few minutes with the master's work. I consider myself fortunate to have been able to volunteer my time and actually work inside the exhibit itself. I never tired of looking at his exquisite drawings. I am looking forward to seeing "The Virgin of the Rocks" at the Louvre after gazing at his magnificent sketch of the angel here. I spent my SATURDAY as the cheerful greeter reassuring all these visitors that the wait really WAS worth it! My SUNDAY morning will be spent at my church, Independent Presbyterian Church. I took this photo the other night and am pretty proud that I captured it without a tripod. Team Minneapolis, thanks for all your tips and encouragement. Mitch, how are my "skills"! To see how other bloggers interpreted the TWO THINGS CHALLENGE click here. Dr. Don reads with his "buddy". Today's post is dear to my heart. One perk of retirement is that you get to do things you didn't have time for before. The S.T.A.I.R. (Start The Adventure In Reading) program at my church is one of them. Four days a week, second graders from four inner city schools come to our church after school for a snack (a really big deal) and reading instruction with a one on one tutor. Since each student comes twice a week, that means they have two different tutors who can't wait to listen to them read, teach, praise, and encourage them! Some of the tutors are retired like me, and others are businessmen, high school students, community volunteers, doctors, etc. Most are from our church but thankfully we have dedicated volunteers from other area churches who join us. One thing we all have in common is the desire to help these girls and boys acquire the joy of reading and help them get better at doing just that! Periodically throughout the year, the families of the students are invited to come for supper at the church. Last night was the first family supper of the year. A grand turnout where the families were able to meet the tutors and enjoy time together. A special thank you must go to Anna James and Evelyn Puckett who run the STAIR program like a well oiled machine. What a blessing this program is to our community and our church as well. The Tune du Jour is " Wonderful World" by Art Garfunkel, James Taylor and Paul Simon! Two offerings. For once, not a lot of chat.....just enjoy! PARIS COUNTDOWN..... at last one digit .....9 DAYS!!!! Go ahead, I know what you're thinking, "Shameless self promotion of grandchildren again." Actually I was going to run the nice photo below that I took at the Birmingham Botanical Gardens the other day. The trees around here are virtually begging to be photographed. Then this afternoon , Laura Kate and I took a spin through the gardens for a little diversion, and I grabbed a few snaps of her in exactly the same spot, before she put her foot down! (When that happens, it's time to move on.) So which would YOU put on the portal....L.K. or the tree/gate shot??? That's what I thought. Now I have cleared my Daily Photo conscience. There are two Tunes du Jour today. The first is "Will and Anna" from Nottinghill. The second is a song I found a while back and have held onto until the election. It will bring a chuckle no matter who you voted for. "Dear Mr. President" by Randy Newman from Forest Gump. It's time for a change of pace around here. Yesterday I scrolled down through my 3 zillion photos looking for inspiration and stopped right here. I love to photograph architectural details. Do you think I'll find any in Paris??? These lovely old twisted handles are at the entrance to Holy Trinity-Holy Cross Greek Orthodox Cathedral. They are so sculptural yet sturdy and functional at the same time. You may remember that I first posted some photos of this church's wonderful renovation here and their Greek Food Festival here. "The wind of change is blowing through this continent." The American people have spoken. That's as it should be. What I really didn't expect was the vast number of my readers from around the globe who have shown such positive support and interest for what is happening in my country. May President-elect Obama ignite hope for the future, possess the ability to heal our country, and above all, be instrumental in forging peace around our world. It is time. We're back at the Bare Hands Gallery for another helping of the Day of the Dead Festival ( See yesterday's post for more). The top photo features one of the MANY alters that were found all around the outside area. The bottom photos show the narrow hallway that was literally decorated from ceiling to the floor with rememberances, photos, memorabilia, lights and glitz. We walked single file taking in as much as we could! The floor was strewn with fresh yellow and orange marigolds. A challenge to photograph! Well yes, I've changed that Banner Photo again! This is where I am training for the "Paris Marathon" which begins in just 12 days! As I walked this 3 mile stretch this morning, with my IPOD playing some of my very favorite music, I thought how I'd like to be able to show you just how beautiful this trail really is. The sky was so blue, the trees turning glorious colors and leaves sprinkling down all around, and the sunlight, oh the light! After my walk, I went and fetched my camera and snapped a few shots of this gorgeous autumn day. Enjoy!! The Tune du Jour is "Angel"